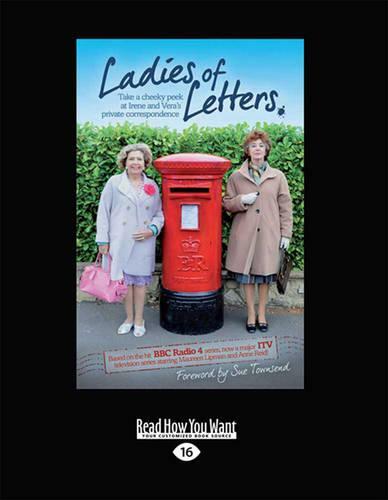 Created by writers Carole Hayman and Lou Wakefield, Irene Spencer and Vera Small - aka "the ladies" - are happily widowed and live in a world of church f tes and amateur dramatics. But when Irene meets Vera, tipsy and tangoing, at Irene's daughter Lesley's wedding reception, they embark on a correspondence unlike any other in the history of letter - writing. In their letters they share all the twists and turns of life's rich tapestry in true acerbic and forthright form - swapping family stories and subtle put - downs with ease and aplomb. It is through the ladies' narrow vision that we learn to love their long - suffering families, and through their increasingly hilarious escapades that we learn to love them. Irresistible in its depiction of the foibles of female friendship, Ladies of Letters is a sparkling collection of letters full of humour and vitriol in equal measure.